In case you’ve been on Mars for the last 24 hours, Nikon have just announced their 2nd full frame (or FX in Nikon-speak) camera, the D700. As with all things Nikon, Thom Hogan has already posted some interesting thoughts. It’s basically a D3 sensor packed into a D300 body, so it loses the built in battery grip, 100% viewfinder and 9fps of the D3 but gains the compact dimensions (for a pro camera) and built in flash of the D300. That Nikon would use the highly regarded 12MP D3 sensor in a lower end body was widely expected, and I’m sure the new model will sell like hot cakes to pros and high-end amateurs alike. 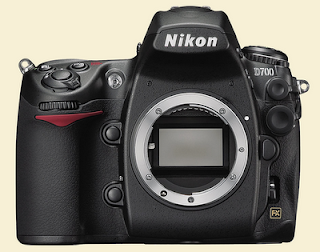 In fact, I'm also sure there are many people who have bought a D3 for whom a D700 is actually preferable. Since inventing the category in 2005 years Canon has had the only offering in the ‘affordable’ full frame market with the 5D, so it is good to see some competition at last. In fact, at over 2.5 years old the 5D is now the oldest camera in Canon’s line-up (with no competition until now it's eay to see why! ), and a replacement is expected to be announced soon – August has been a preferred month for their previous camera launches, so we may not have long to wait. As a Canon shooter I’m looking forwards to this one. I’d like to see something along the lines of the leaked German Canon website I posted a couple of months ago – 16MP, 5fps, weather sealed body. I’d happily trade in my 1Ds IIs for a couple of these, as I don’t really need the 21MP of the 1Ds III and would gladly pocket the savings in weight and bulk. But if the new body isn’t weather sealed then at least one 1Ds II will remain in my arsenal – too much of my shooting takes place in conditions that are hostile to electronics, be it snow, rain, cold, heat or humidity, and while the 1Ds just shrugs it off I wouldn’t trust a non-sealed body to last long with that sort of punishment. And most of us are expecting at two more full frame cameras, if not at Photokina in October then before. The new Sony A900 with its 24MP full frame chip has already been announced but we have yet to see a production model, and the hotly anticipated Nikon D3x which it is assumed will use the same chip.